Hats not yet counted. And this is just one tub of three! The November incentive hat is A Chill in Wonderland by Izzy Schutz. Post completed hats in the the thread to get your hat. Sharon from Knitaholics Anonymous offered a hat pattern (Bow Cloche in Memory of Linda). Go to here for details. Purlescence Yarns, tagged for Team Knotty. Shipping information is here. Laura had a trunk show at Colors 91711. She is almost done with the remodel and assembly of her studio. She’s been working on lots of Nerd Wars stuff and dying up yarn for the next installment of the Mean Girls Yarn Club. Jen has been cooking a lot. She’s using a seasonal cookbook that she loves. She is also reading Carole King’s autobiography. She’s been spinning. And she saw a workshop of a play her friend wrote. It was part of the Blank Theatre’s Living Room Series. Jen also gushes a bit about the “Day of the Doctor” and Hunger Games: Catching Fire. Laura is working on Gavin’s DinoRAWR Spiked Beanie Hat by Niki Wyre out of Knitpicks Brava. She is also working on the third incarnation of her Companion beaded choker in Hempathy for the Nerd Wars “Wave Your Geek Flag” challenge. And she continues to work on a Big Damn Hero Hat by Dryope out of Knitpicks Brava. Jen is working on her Christmas project, on her Sunshine Socks by Cookie A in Dream in Color Smooshy in Butter Peeps, a Gerri Hat for the Throwdown out of the Peter Pan Wendy Yarn in pink, some very old vanilla socks out of some very old Opal Sock Yarn, and a plain vanilla hat out of Plymouth Encore Yarn in white. She also started Kently Socks by Heather Ordover from Hitch: Patterns Inspired by the Films of Alfred Hitchcock out of Koigu for Ron. Laura finished her Odessa Hat (without beads) by Grumperina out of Mean Girls Yarn Club mini skeins in Curses (acid green and purple). She also finished her Broncos Gridiron Scarf (Lattice Wingspan) out of Mean Girls Yarn Club Hoar’s Yer Buddy. We mention Jeny’s Surprisingly Stretchy Bind Off. Laura still has her Sassy-tis (Clapotis by Kate Gilbert) in Devil’s Tower for Nerd Wars, waiting for Round 3. And she is just having trouble feeling motivated to work on her sock design out of Lambie Toes. Laura also talks about a way to motivate herself to finish her WIPS. We mention Slipped Stitch Studios and the Doctor Who Sock Kit from Lorna’s Laces. Laura will be crocheting Hildegard by Bernadette Ambergen in Lambie Toes for her booth at Stitches. We mention Belle Époque, Skeindalous Yarns, Into The Whirled, and Indigodragonfly. Jen will be making hats and a baby sweater. We review Fiber Factor Challenge 6. We remind you to vote for your favorite designs by clicking “Love” in the Socktober FO thread. Voting closes November 29th. Prize winners will be announced in Episode 15! We draw the winner for our 500 member Milestone Prize and it’s Astridpurls! Congratulations! Ravelry Message Laura for your prize (a pair of Toluca Knit Jewelry Needle Gauge Earrings. We review the young adult novel Grounded: The Seven by Heather Ordover. We highly recommend the book for yourself and your teenagers you love and are waiting impatiently for the sequel! She also has a book of socks inspired by the characters of Grounded called Novel Socks. Jen has it and she loves the patterns. We point out some templates for making Star Wars themed snowflakes for your geeky holidays. We also point out two lists of ranking all the episodes of two of our favorite shows: Doctor Who and Buffy The Vampire Slayer. We mention the unaired pilot for Buffy the Vampire Slayer and the unaired pilot for the Big Bang Theory. Hatnado!!! Come watch (and mock) the masterpiece of a film known as Sharknado! 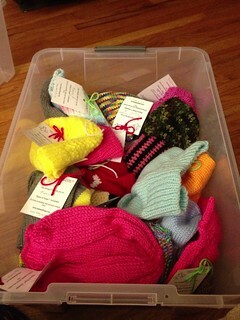 and knit hats for Halos of Hope with us. 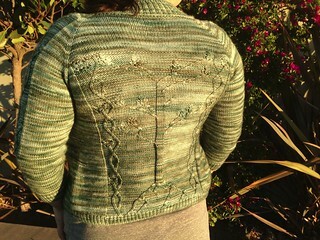 It will be in the Annex of the Alamitos Bay Yarn Company on Saturday, December 14th from 1:30 to 4:30pm. Bring munchies and wine to share if you want to. We will bring cake! Seating is limited to 18, so watch this space for signups. And finally we will be at Stitches West, which is February 20-23 in Santa Clara, CA at the Convention Center. Dizzy Blonde Studios & Skeindalous Yarns are sharing a booth; we will update you with the booth number when we get it. Halos of Hope will have a booth and we may have a Meet and Greet. We will also be attending Friday’s Fashion Show and Dinner. The Dizzy Blonde booth is a collection point for Halos of Hope hats for Team KnottyGirls (the final collection point!). With prizes! Our next milestone prize will be at 1000 members, so join the Ravelry group, don’t forget to vote for your favorite Socktober Project, and remember to keep knitting hats. There are prizes for donating to Team Knottygirls. Check out Episodes 10, 11, and 12 for prize listings. Jen took a whirlwind trip up to her parents’ house for her nephew’s first birthday. She’s also been planning the Thanksgiving menu for her house and working on the Halos Hats because the El Segundo Slipt Stitchers are awesome and so is the Long Beach Stitch and Beach. Laura and Jen talk about WeFF. They both enjoyed it. They talk about yellow-unfriendly lighting. We also mention Forbidden Woolery, Blarney Yarns, and Krupnikas. Laura has carpet in her house! And had to get some car repairs after hitting a planter. Tony fell and hurt his wrist, so she has had some bad luck this weekend. She’s prepping for the holidays, which is difficult as she is from a blended family so scheduling gets tough. Jen has been working on her secret Christmas project, a Christmas sweater for her nephew (her own design) out of Stitch Cafe Delicious Yarns, the Knit Dizzney shawl pattern (also her own design) out of the Dizzy Blonde Sock Yarn, and a Gerri Hat for the Throwdown out of the Peter Pan Wendy Yarn in pink. Laura has been Stashing Down for Nerd Wars. She’s been working on an Odessa Hat (without beads) by Grumperina out of Mean Girls Yarn Club mini skeins in Curses (which is acid green and purple). She’s also working on an “Outlaw Hat” by Dryope out of Knitpicks Brava. Jen finished her Minion Hat for Halloween at work out of Plymouth Encore Yarn. She also finished her 30 Day Sweater sweater out of Dizzy Blonde Superwash DK in Anna. 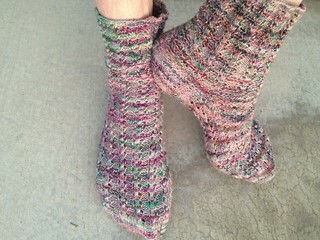 She also finished Ron’s socks out of Koigu, but not in time for Socktober. Laura finished one “Outlaw Hat” out of scraps of Lamb’s Pride in very bright colors. She finished her Tree of Life Fingerless Mitts by Jenny Williams out of Knitpicks Wool of the Andes in the Thistle colorway. Jen is picking up both her Sunshine Socks by Cookie A in Dream in Color Smooshy in Butter Peeps and her Watership Down shawl in Unique Sheep Selene in the colorway Nature Walk. Laura still has her Sassy-tis (Clapotis) in Devil’s Tower for Nerd Wars, but it coming out soon. Also her Broncos Gridiron Scarf (Lattice Wingspan) out of Mean Girls Yarn Club Hoar’s Yer Buddy is waiting for her to fix the bind off edge because she doesn’t like it. Jen had a happy accident with the shawl collar on her 30 day sweater. It was too small and didn’t fold over like she wanted, but she decided she likes how it looks, so it’s a happy accident. Laura had to rip out her entire Socktober sock (which was her own design being worked up for Lambie Toes) because she didn’t like the ribbing. 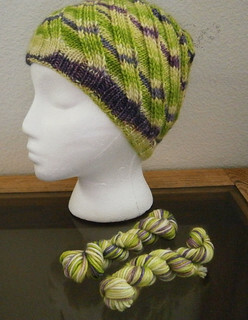 Jen will be working on more Throwdown hats and her own sweater design out of Wollmeise DK and Shalimar Breathless DK. Also a California Poppy Shawl out of Baah La Jolla in My Sweet Valentine for Melissa. Laura will be working Throwdown hats, hats for her family, continuing the sock design, and the third incarnation of her Companion beaded choker in Hempathy. We mention the Mountain Ash Shawl. We review Hitch: Patterns Inspired by the Films of Alfred Hitchcock, edited by Stephannie Tallent, sent to us from Cooperative Press. We both love it and highly recommend it. All of the patterns are gorgeous, the styling is gorgeous, and we want to knit everything. And we love the schematics. We also point out this YouTube video of the Magic Knot as a way of joining ends. The Socktober KAL is over. Two prizes will be random drawings, and there are two peoples choice awards. Go “love” your favorite projects in the Socktober FO thread. Voting closes Black Friday! Prize winners will be announced in Episode 15! We both answer a question from our Knotty Talk Thread. tygherknits asks Impatiently waiting for the next episode! I just want to hear more! And I think Laura should talk about noms some more. So we geek out about cooking! Jen mentions some of her favorite baking recipes (lemon blueberry cookies and mini cheesecakes in a jar), a pie recipe she really wants to try, and asks for pie crust tips. She talks about peach-blueberry thyme cupcakes too, because she loves savory mixed with sweet flavors. Laura talks about her booze-infused cupcakes, her “noms” (the lollypops she makes), and making geeky chocolate candies. Jen also talks about wanting to be a better cake/cookie decorator, we talk about Portal cookie cutters, and we mention Craftsy (which has cake decorating classes as well as fiber-related classes). We have started a cooking thread, so come share your own cooking joys or woes and awesome recipes. We are still working on a Throwdown knitting event, watch this space. There will be cake, Sharknado, and food. Hatnado! There will be a Dizzy Blonde trunk show at Colors 91711 in Claremont on November 23 from 2-6pm. There will be Lambie Toes for sale as well as kits. The Los Angeles Yarn Crawl will be from April 3-6, 2014. Our next milestone prize will be at 500 members, so join the Ravelry group! Thank you to El Segundo Slipt Stitchers for the hats donated! 3. Heather of Mad Color has donated a skein of yarn. Laura loved the CogKnitive Fibre Retreat and is taking care of the admin for the post-marketplace and dying a lot to prepare for WeFF. Her voice is back. The remodel is making her crazy, but it’s almost done and to channel that, she is planning a trip. Jen has been spinning! She’s working on Knitpicks fiber. She really enjoys it. She saw the film Gravity, which had a lot of space geekery and the film Enough Said, which had knitting in it! Laura has been working on a new sock pattern to be knit in Lambie Toes in the color No Touching Guns. She’s test knitting the A Chill in Wonderland hat in Knitpicks Brava Worsted. And she is working on the third version of her Companion beaded choker in Hempathy. Jen is still working on her 30 Day Sweater in the Dizzy Blonde Superwash DK in the colorway Anna. She’s also working on Ron’s sock, which are the Bed Sock in Lemon Pattern with Fancy Knit Stripe from Knitting Vintage Socks out of Koigu. She’s working on another Gerri Hat for the Throwdown out of the Peter Pan Wendy Yarn in pink. She is also making a Minion Hat for Halloween out of Plymouth Encore. We confirm that 30 is no longer even close to middle aged and that middle aged is a silly concept. 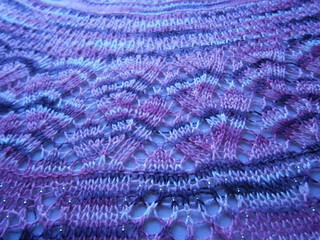 Laura has finished her Udones out of Knitpicks Palette in clover. 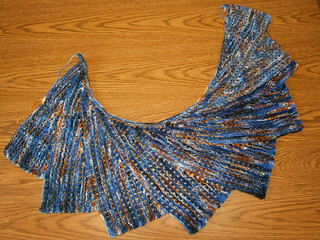 She also finshed her Broncos Gridiron Scarf (Lattice Wingspan) out of Mean Girls Yarn Club Hoar’s Yer Buddy. She needs to block it, but she has no room. Jen never finishes anything. She has tons of projects on hold for the 30 day sweater, including her Rocky Coast Cardigan, her Sunshine Socks, her secret Christmas project, and her shawl design for Knit Dizzney. Laura is putting her Sassy-tis (Clapotis) in the Devil’s Tower until November, so it can be a flexible schedule for Nerd Wars. Same with her Tree of Life Fingerless Mitts. Jen has everything in Devil’s Tower. Jen thought she lost her knitting, but she really just misplaced it. Laura will do some more hats, both for the throwdown and her family, possibly the Sous Chef hat. Jen will be working on throwdown hats, a shawl for Melissa, a sweater for her nephew, the Knit Dizzney shawl, and her own sweater design. We review Fiber Factor Challenge 5. 2. An article about Mathematical Knitting from American Scientist. 7. Illusion Tessellation by Deborah Tomasello (and she has socks as wells). We also mention the What Would Madame Defarge Knit? books and the Jane Austen Knits. We are working on some knitalong events for the Throwdown. We will keep you updated. It will involve Sharknado and cake. There will be a Dizzy Blonde trunk show at Colors 91711 in Claremont on November 23 from 2-6pm. There will be Lambie Toes for sale.